We Can Eliminate Fossil Fuels, No Problem! French President Macron has implemented a new fuel tax to discourage drivers from burning fossil fuels in their cars. The resulting higher fuel prices have caused more than 250,000 people to protest, with some rioting. Polls indicate that 62 percent of the population think that prioritizing man-made climate change over fuel prices is wrong. The rioting has led to two deaths and over 600 injured. Almost 100 police officers have been hurt. Macron’s popularity has sunk to 21 percent in a warning to other leaders who try to fight climate change with higher fossil fuel taxes. While Macron is unpopular for many reasons, the increase in gasoline taxes was the spark that ignited the protests and rioting. Figure 1. Riot police facing the “yellow jacket” demonstrators in front of a burning barricade in Paris on November 24, 2018. Source: News.com.au. 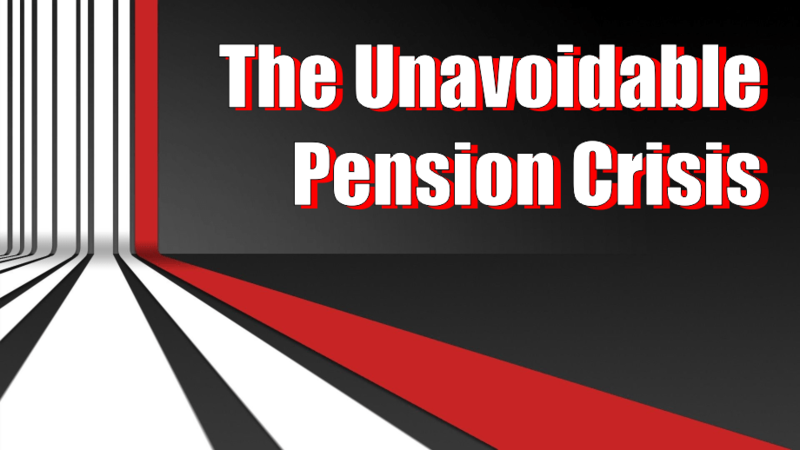 But it isn’t just these municipalities that are in trouble, but also most of the public and private pensions that still operate in the country today. Stress in the oil industry is starting to contaminate other parts of the American economy. For the first time since oil prices began crashing in mid-2014, banks polled by the Federal Reserve are warning of a “spillover” effect onto loans made to businesses and households in energy-dependent regions of the country. Senior loan officers of nearly 100 banks acknowledged that credit quality has “deteriorated” on everything from auto loans and credit cards to commercial real estate mortgages. Translation: More people aren’t paying and delinquencies are rising. It’s a sign of how the deep spending cuts, mass layoffs and even bankruptcy filings in the oil patch are inflicting real pain in certain energy-focused states like Texas and North Dakota. Some large U.S. banks have individually warned of early signs of so-called contagion. Half of immigrant households, both legal and illegal, received some kind of public assistance in 2012, compared with 30 percent of non-immigrant families enrolled in welfare programs, a new report shows. 1. U-Haul Update (above). The table above displays one-way rental rates for a 26-foot U-Haul truck to travel between California (LA and San Francisco) and Texas (Houston and Dallas). 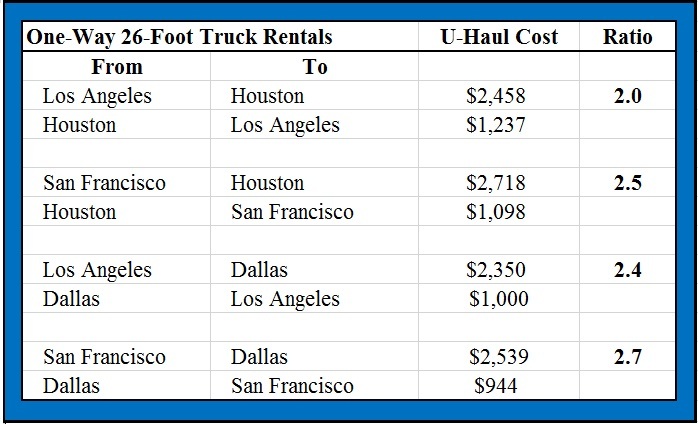 Assuming that these market-based rental rates accurately reflect migration flows of people and businesses between California and Texas, the demand for trucks (and people and businesses) leaving high-cost, high-tax, business unfriendly California for low-cost, low-tax, business-friendly Texas is about 2-2.7 times greater than the demand for trucks leaving Texas for California. Maybe there’s an economic lesson here?